Adolescence can be a challenging time in a child’s development, but when losses, adjustment issues, or trauma affect the child, it makes it all the more difficult. Teenagers often feel self-conscious, under stress, and shut down. Sometimes teenagers in traditional talk therapies fail to feel engaged. Imagery and art tap into our earliest ways of understanding the world, they invigorate and give a voice at times when language is inaccessible. Art combined with an empathic therapeutic relationship can bridge resistance and offer outlets to painful emotions and provide creative problem solving to life’s challenges. Art Therapist and Licensed Professional Counselor, Michelle Dean, MA, ATR-BC, LPC, CGP was recently invited to speak to clinicians at Reading Hospital about her use of art therapy and adolescents. 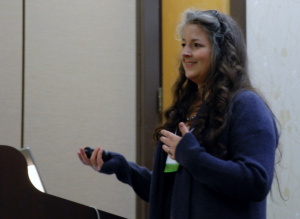 Her presentation helped clinicians understand critical developmental issues of adolescence and how art and imagery-based interventions support the sometimes, rocky transition from childhood to adulthood through a powerful means. Below are some of the discussion points that were shared. The ability to understand abstract concepts – Starting around the age of 12, the cognitive ability to think abstractly forms as result of brain development. Often teenage development is asynchronous, with varying degrees of maturity in interpersonal relationships among peers, teachers, and parents. Although the adolescent may appear physically developed, emotional or cognitive development, especially judgment, may lag behind. These differences are normal and usually temporary but become intensified under pressures of academics, peer and family relationships, and stressful situations such as conflicts and trauma. The difference between expectations for the young adult and his or her capabilities can lead to frustration for the adolescent and for those who care about him or her. The struggle for independence and individuation is real with frequent vacillations between wanting to take care of things independently versus having support or being cared for by others. This is often confusing as loved ones struggle to find how much and when to help the adolescent. It stimulates a desire to express – “Make their mark.” This can be seen in the repetition of writing’s one name as well as in graffiti often done by young adults. Imagery is an extension of memory and conceptualization processes – If we can see it, we can better remember it. Metaphoric and mythical language is crucial – it allows for fantasy and role-playing. With increased abstract abilities, language and imagery can be metaphoric and no longer literal. Art created in therapy can hold many meanings simultaneously. It is a way of communicating that, which is both objective and subjective. It is a way of seeing both the external world and one’s inner world and helps facilitate understanding of the intersection of the two experiences. It represents multiple perspectives and relationships at once – It is a polyvalent method. It is both tangible and permanent – growth can be seen and recorded over time and is undeniable due to the permanent nature of the work. It can be visited again because it is tangible and concrete. When combined in a group context, it assists with interpersonal relationships and absorbs the sometimes, angry, and at times, defiant stance that is common in adolescence. Art making in therapy provides structure so the adolescent may thrive. Michelle L. Dean, MA, ATR-BC, LPC, CGP is a board certified art therapist, licensed professional counselor, and certified group psychotherapist who co-founded of The Center for Psyche & the Arts, LLC (http://psychearts.org), a clinical practice and professional continuing educational center, with two locations in the Philadelphia area. She works with individuals who struggle with addictions, eating disorders, relationship issues, and survivors of traumatic experiences. In addition to her clinical practice, she is an author, supervisor, educator, and consultant. She has been an Adjunct Professor at Arcadia University since 1997 and has several publications to her credit, including her book, Using Art Media in Psychotherapy: Bringing the Power of Creativity to Practice. Her work has been recognized through many distinguished awards, including the prestigious Honorary Life Member Award from Delaware Valley Art Therapy Association and the American Art Therapy Association’s 2015 Pearlie Roberson Award. She serves on Executive Board of The American Art Therapy Association as the elected Secretary. Blos, P. (1962). On adolescence. New York: The Free Press. Dean, M. L. (2016). Using art media in psychotherapy: Bringing the power of creativity to practice. New York: Routledge. Dean, M. L. (2008). Preserving the self: Treating eating disordered individuals who self-injure with art therapy (pp. 56-82). In Brooke, S. (Ed). Creative arts therapies with patients who have eating disorders. New York: Charles C. Thomas. Isis, P. (October 2007). Using Art Therapy with Troubled Adolescents. The Australian and New Zealand Journal of Arts Therapy, 2, 1, 1-33. Riley, S. (2001). Art therapy with adolescents. Western Journal of Medicine, 175, 1, 54-57. Riley, S. and Malchiodi, C. (1994). Integrative approaches to family art therapy. Chicago: Magnolia Press. Rubin, J. A. (1984). Child art therapy. New York: Van Nostrand Reinhold.